As I play these games, I am finding them to be transformative. They are helping me to see other games and adventure writing in new ways. I want to share some of that, as well as how you can bring these elements into your current RPGs. Let’s start with SotDL! In SotDL, heroes are in a dark dangerous world that is on the verge of falling to the apocalypse. Evil has nearly won, hope is fading, and as the darkness surrounds the land, this crucible serves to heighten the tension and drama. This is a game where the map of the world has the word “EMPIRE” written in blood across a swath of land, leaving no mistake as to the perils it faces. 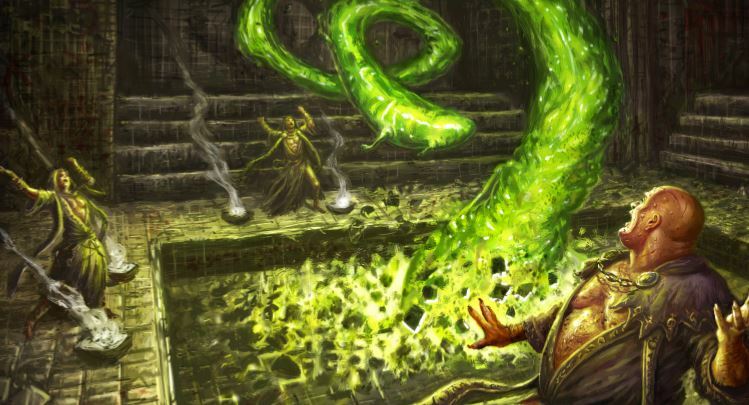 PCs earn levels quickly in SotDL – leveling up after your first adventure and typically with each major story objective. With 10 levels maximum, this is a fantastic concentrated experience. Too often (especially as we age) we struggle to complete a campaign. Fast leveling and focused story help us complete a satisfying campaign. How to use this: In D&D, session-based level advancement is covered briefly on page 261 of the DMG. In any RPG, level characters after every session. Importantly, frame each session so it is an important event (perhaps towards averting the apocalypse – see part 2 for how Phoenix handles this). 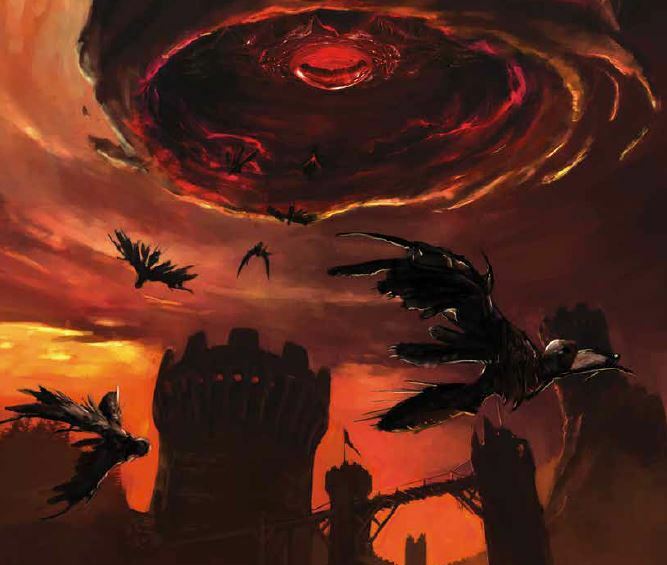 In SotDL, the DM can set the actual force behind the apocalypse and its aspects can even change over the campaign. The book showcases how the shadow of the demon lord can manifest early on in an orc lord ravaging the lands, then fall upon the great druid, creating pestilence. 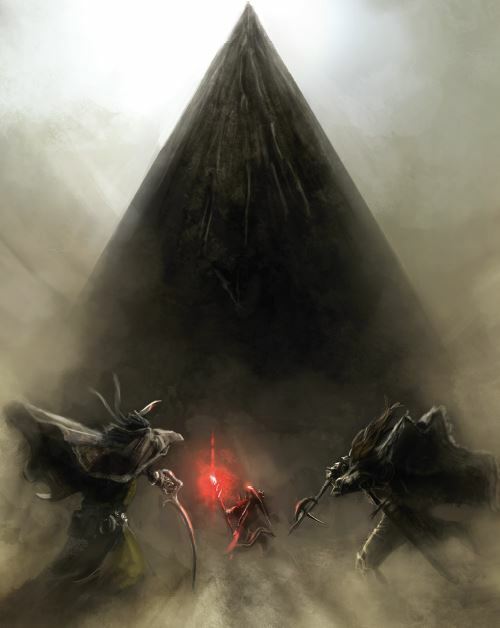 How to use this: The idea of a dark supernatural (or godly) threat behind foes is a fantastic idea, and a nice spin on the “wheels-within-wheels” giants-drow-Lolth concept of early Greyhawk AD&D (where the true foe was slowly revealed as lackeys were defeated). The idea of the shadow falling on an aspect of the game is something you can also do as the campaign evolves, based on player interests. Maybe it’s the king next, maybe the druid, or maybe the church… which do the PCs interact with the most or least suspect? This could even be done in a single adventure, within a single town! In SotDL you level quickly, but level means something different. You start with just your Ancestry (similar to a D&D race) and a profession (similar to a background). Roughly every session of play you gain a level, but what you get varies by level. At level 1 you choose a Novice Path (magician, priest, rogue, warrior), which comes with a lot of flavor and establishes additional aspects of your character. As a magician, you might gain your powers through a magical mishap or perhaps it is an unfolding prophecy. At level 2 you advance your novice path, choosing from several options. However, at level 3 you gain an Expert Path that really helps to make your character unique. If you are a magician you could become an artificer, sorcerer, witch, or wizard. Each has different capabilities and options. Here’s the really cool part. At level 4, you go back and advance your Ancestry again! If you are an orc, now you can further develop that as you might gain a magical capability or unleash your inner rage. This level advancement system continues to alternate between these choices, eventually also adding a Master Path. The alternating system constantly evolves the different aspects of your character, keeping them present in your mind. Each level offers at least one choice, meaning your character is constantly evolving in different ways to reflect your character concept. 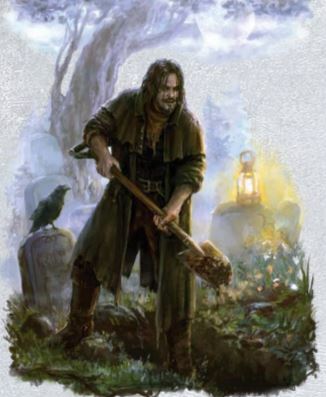 When I played an orc gravedigger, my concept developed and solidified with each level – my shovel became a magical weapon, imbued with dark energy from the graves I had dug. I buried my foes, holding their failures and darkness within the spade and using it to fight the apocalypse. How to use this: Mimicking SotDL’s constant character evolution isn’t easy. Homebrew could certainly do it, adding choices at some levels to choose between class powers and a race power, but an easier method is to add magic items that mimic this evolution. What if your fighter’s weapon evolved with them each session, tied into their race and background, and reflected who they wanted to become? 13th Age has some of these concepts, but I bet something could be done here that wouldn’t strain the underlying RPG system. I recommend playing SotDL to really get a feel for how the system works. It is excellent! When a check is harder for some reason (maybe you are on a moving ship) the DM can assign a bane. This adds a d6 that you roll and subtract from your total. Boons are the opposite. You can have multiples. Maybe the storm is causing the ship’s deck to heave, so you suffer 3 banes, but the crew is helping you, so you gain 1 boon. The net result is 2 banes. In all cases, you roll the net result and take the die with the highest number, then add (boon) or subtract (bane) it from your total. Setbacks are cases where a roll is a success, but the DM assigns a downside. An Opportunity is where you fail, but with some upside. The book’s example is that you fail to pick the lock, but you spot the key’s location. An optional rule also allows players to trade boons/banes setbacks/opportunities. Fearing failure, the player can forgo 1 boon to receive an opportunity if the result is indeed a failure. Or, the player could remove a bane to increase the chance of success, but if the roll succeeds they will automatically suffer a setback. Using Advantage could grant an “opportunity” even if the roll fails. This makes Advantage more useful to the player and thus more likely to be used. In both cases, the setback and opportunity can be either defined by the player or the DM (SotDL discusses this). It can be a lot of fun for players to describe this and the DM adjusts as needed. You could implement a Boon/Bane system, perhaps granting boons for role-playing. Softer than advantage, it could be used more often. An encounter could pile on banes until the PCs do something (cleanse the altar, etc.) or impose them for a situation (being in a hurricane). A roll with advantage might automatically discard all banes, making it very useful if your game often provides serious challenges. Rules and ideas on ruptures from the void into our world, including mutations and effects on nature and wildlife. Impacts on magic, gravity, and the like. Groups that would follow and worship the coming evil. Lots of cool monster ideas, including ways you could build a Demogorgon. Pick up the Shadow of the Demon Lord core book directly from Rob Schwalb’s site. 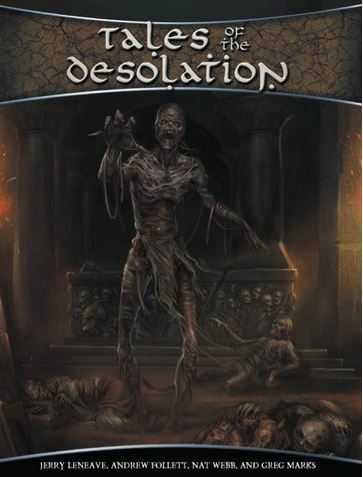 At Winter Fantasy I played the adventure series Tales of Desolation and found it an excellent series to grasp the setting and learn the rules – lots of horror but still heroic. Buying direct is best, but you can also purchase these in pdf and print-on-demand at DriveThru RPG. The core pdf is currently priced down to just $16 and Tales of Desolation for just $4 ($11 print)! Rob’s Kickstarter was hands-down the best I’ve ever experienced. I actually feel guilty to have received so much. The game is incredibly well supported, with 100 different titles! Rob made my D&D amazing, my SotDL amazing, and I can’t thank him enough – please support his amazing work. Dread Gazebo’s 10 Great Reasons Why You Should Give Shadow of the Demon Lord a Try and his actual play sessions. The Tome Show discussed how the Adventurers League supports store play, complaining that stores are no longer sufficiently supported by WotC. Here is my quick take: If there is one constant in organized play, it is change. The balance between home/store/convention is always shifting and someone always calls foul. D&D Encounters was an amazing in-store organized play program run between 2010 and 2015. It provided stores with amazing (expensive) materials. Some stores abused those programs, registering for the program but selling the material online for $100 a packet. I would guess that the high cost and the flagrant abuse created an impression at WotC that the approach had to change. The change also coincides with a momentary drop in support for conventions, so it may have all been budgetary, with the store changes being more lasting. Still, we should all expect change. Stores are a vital part of WotC’s strategy. I won’t be surprised to see better support in the future, but probably not a return to the expenses made during early Encounters seasons. Stores do need some love, and there was a real benefit to the Encounters system that made it relatively easy for new/casual DMs to provide a strong experience to new/casual players. Can WotC ever achieve a perfect balance between home/store/con? I’m not sure our human brains would recognize it if it was happening… we would likely still see one as being overshadowed. 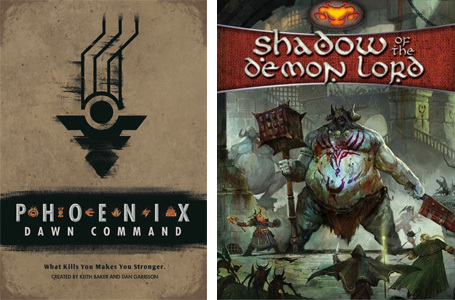 This entry was posted on September 28, 2016 by Alphastream and tagged Character Building, Conversions, Horror, Phoenix Dawn Command, Shadow of the Demon Lord.